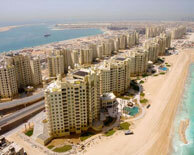 Shoreline Apartments comprises of 12 luxurious towers located on the east of the trunk at The Palm Jumeirah. The complex has six different styles of apartments ranging from 1-bedroom, 2-bedroom,3-bedroom apartments and 4-bedroom penthouses. Each type of unit has a magnificent views of the sea or canal. A wide range of facilities are available inside the building complex making the Shoreline Apartments a perfect place to live.